For Erica and Tom’s Advanced Open Water Dive Course, we went up to Maeda Point for our Deep Adventure Dive ad AWARE-Fish Identification Adventure Dive. Maeda Point is a great spot to do this because there isn’t a long surface swim t get to the deep water and there are also tons of fish! We were all excited about the weather being sunny and the water being super calm. Before suiting up, we all took a look at the water. Very calm but there was a sign at the top of the steps that said divers had to be diving with a professional (divemaster or higher certification). Apparently there was a pretty strong current around the souther point of the entry/exit area. Jason and I didn’t plan on diving that area so we were confident that we wouldn’t be taking any unnecessary risks. While setting up our equipment, I gave a briefing of the skills we would be doing for our Deep Adventure Dive while Jason gave instructions on how we would be making our entry, exit, and where we would be going on the dive. Erica and Tom Heading Down T0 91 Feet! Just before going in the water, we conducted a timed exercise – writing out names backwards. Once at a depth of 91 feet, we again did the same exercise to see if anyone was being affected by nitrogren narcosis. After we made our descent into the water, Jason led us to where it was about 91 feet deep and we settled onto our knees. We then went through a series of skills – first off was writing out names backwards again – everyone accomplished the skill quicker at depth than on the surface. Hmmmm…..I think they must have been practicing in their head while we were suiting up and making our entry! Next we looked at a color chart to see how the depth would affect the color spectrum. Lastly, we compared our depth gauges – we were all within 3 feet of each other. 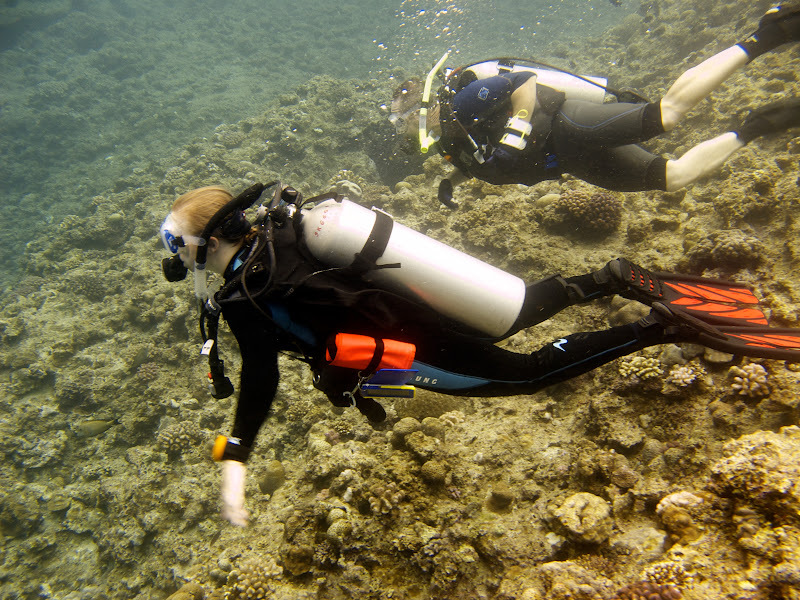 Erica Ascending For Our Deep Adventure Dive – So Fun! After completing the skills, we made a very slow and steady ascent to 15 feet where we made a safety stop for 3 minutes. While doing so, we came across a pretty friendly longfin spadefish. Surprisingly, it wasn’t within a school – it’s pretty much a guarantee that if you spot one longfin spadefish there will be others n the area, but today was the exception to the rule. During our safety stop, everyone did a really good job hovering mid-water. I was glad to see we were all doing our part to help protect the underwater environment. Unfortunately, there was a group of Japanese divers not to far off from us, and they were stepping and kneeling on everything in sight. It pained me to see all the damage they were doing. After making our exit, we climbed up the riciulously long staircase to get back to our car. I was winded by the time I finished getting to the top. Deep breathes in and out! PHEW! Someone should make a business where they will carry your scuba gear up the stairs for a few dollars – I’d pay it in a heartbeat! Once back to our cars, we debriefed while getting suited up for our AWARE-Fish Identification Adventure Dive. Of all the dives in the Advanced Open Water Diver course, this is actually my favorite. We slowly make our way across the reef, count specific species of fish, record interesting behaviors, draw pictures, and then at the end we identify the wildlife we’ve seen. 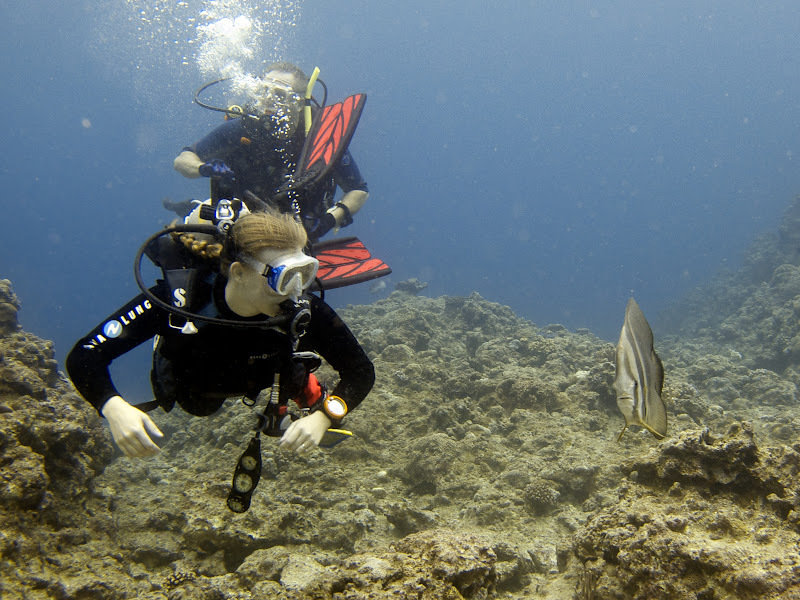 I think it’s a great dive which teaches us to really “inspect” the reef and notice all the little details. 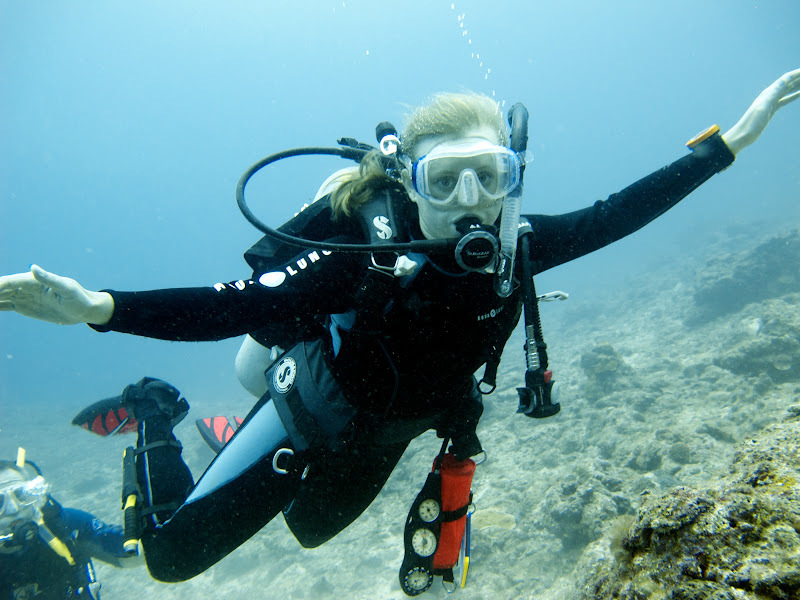 When I first began diving, I just enjoyed going in the water and looking at the large first. 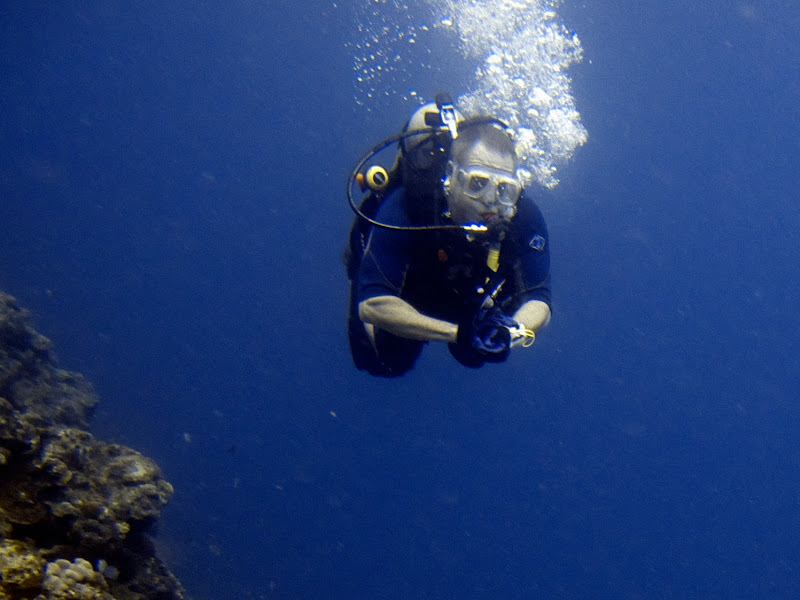 Now that I have a few hundred dives completed, I have started to focus my attention on the micro-life. In a little less than a year, I’ll be moving back to the states and I’m sure it will present me with a new aspect of diving to focus my attention towards. 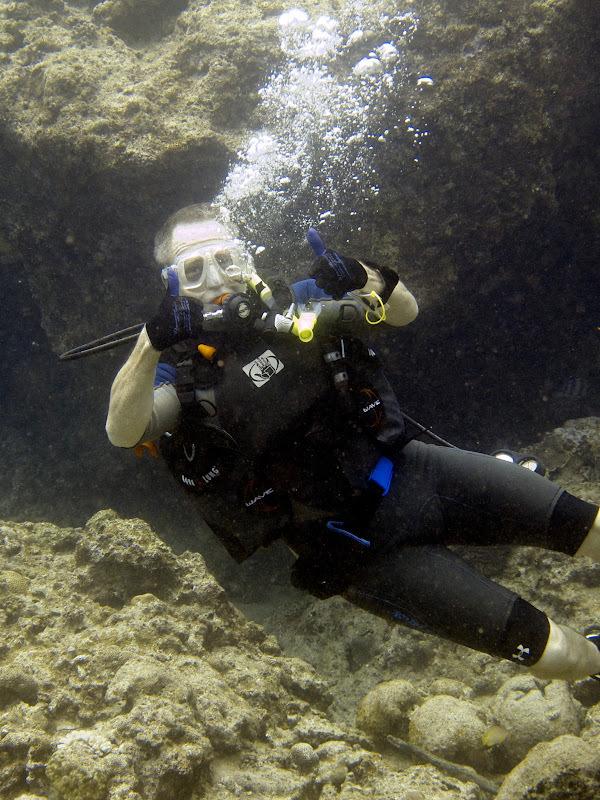 Jason led our AWARE-Fish Identification dive staying at a depths between 15-30 feet. We kept it nice a shallow for several reasons. 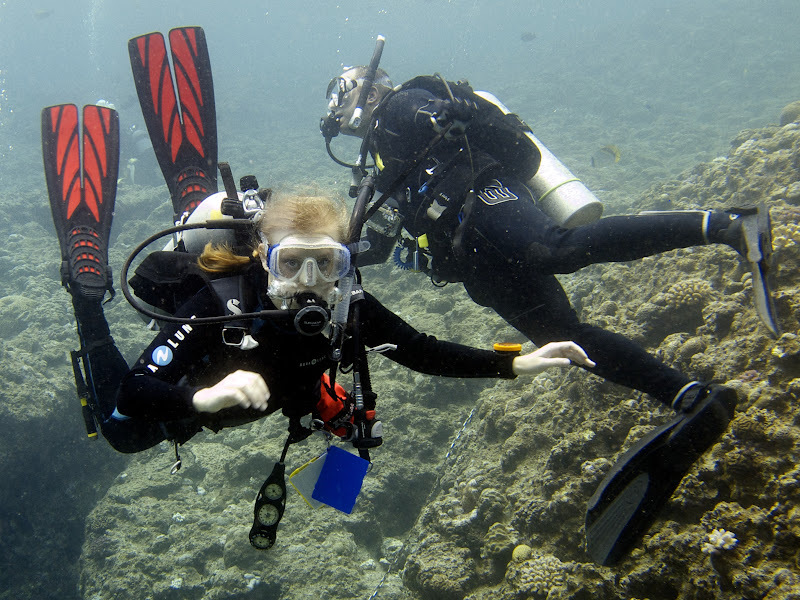 First, even though we had made a long surface interval after making our deep dive, we still wanted to stay nice an conservative to prevent any sort of dive injury involving decompression sickness. Next, most of the fish were located in the 0-30 feet depth range and they were the main focus for our dive – it only made sense to position ourselves where they were located. Because I am more interested in finding interested look micro-life, I didn’t spend a whole lot of time photographing the first. Only when they were particularly interesting, colorful, or had a fun personality did a bother to snap some photos. Early in the dive, I came across a small group fo jewel damsels. One was extremely interested in me and even started to posture himself against me. He would swim up really close to my camera and then turn away and dart back a few feet. I got the impression he was trying to chase me away – pretty hilarious because he was not more than a few inches long. Who knew that fish could be little “Napoleons?” Definitely had to get some photos of this little fish with a big personality! 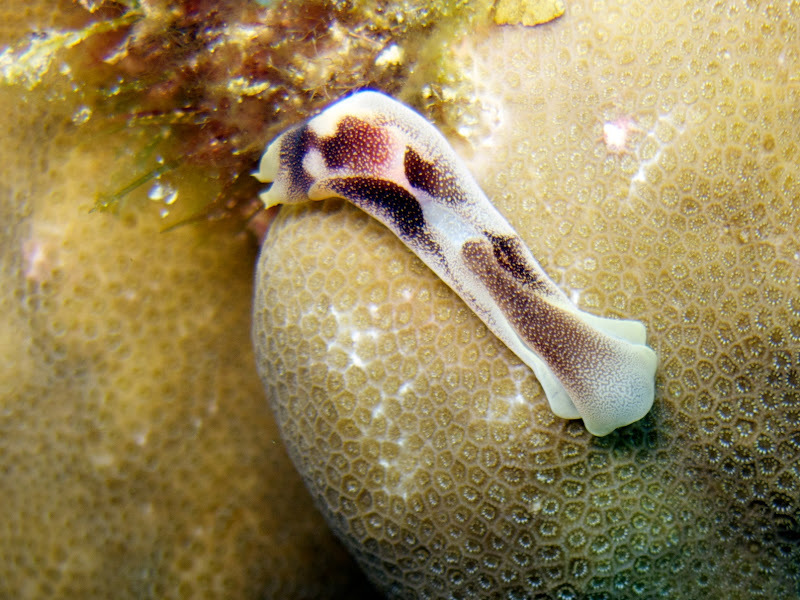 While cruising around the coral in about 20 feet of water I spotted a Chelidonura amoena nudibranch. It was making it way to the underside on a piece of coral so I just took a few quick photos and then moved on to spot something else. 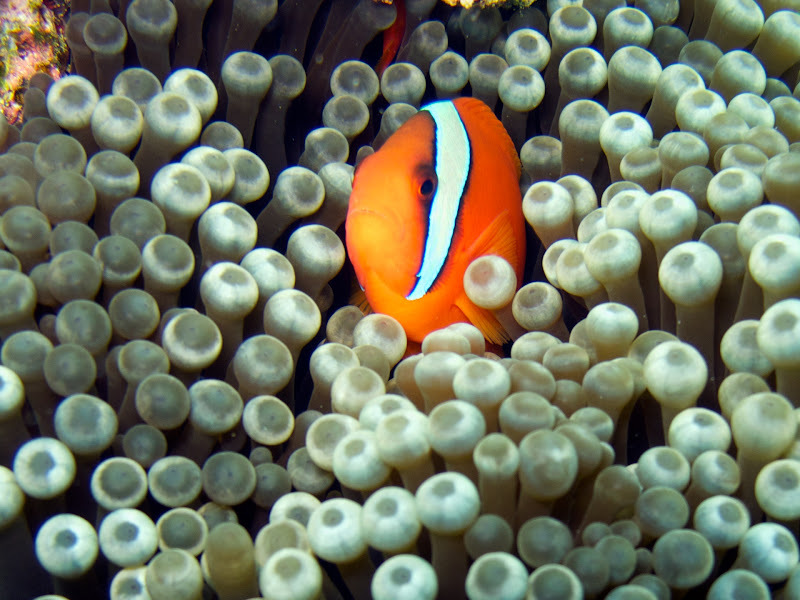 Anemonefish are small fish with big personalities. No matter how often I see this type of fish, I always enjoy photographing them. When I spotted a male tomato anemonefish hiding out in an entacmaea quadricolor anemone (also called Bulb-Tentacle Sea Anemone) I knew I wanted to get a photo. Male and female tomato anemonefish can be distiguished by the color on the sides of their bodies. Males will have orange sides while females have black sides. 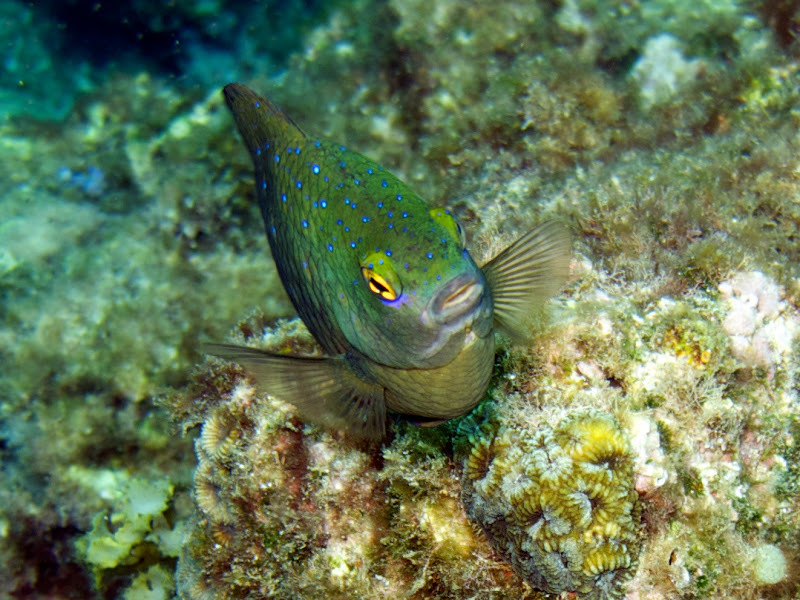 As I came in close with my camera, the male posed himself very nicely within the anemone – the colors of his body provided an excellent contrast against the grey-brown entacmaea quadricolor anemone. Nearing the cave at Maeda Point, I spotted an Aldisa albatrossae nudibranch. 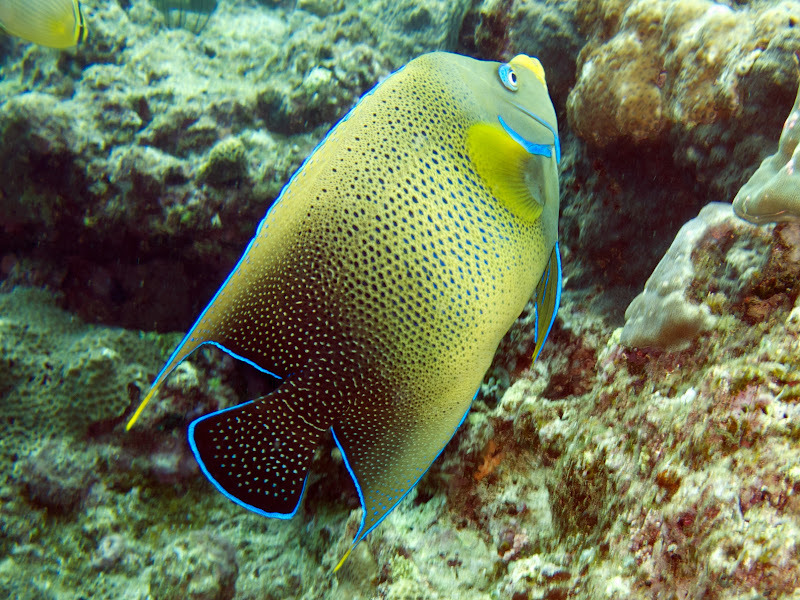 Apparently these are supposed to be uncommon in Okinawa but I’ve spotted about 4 or for in my last 15 dives. Maybe I’m just getting better at spotting them…or I’ve been really lucky. Probably more luck than anything else! 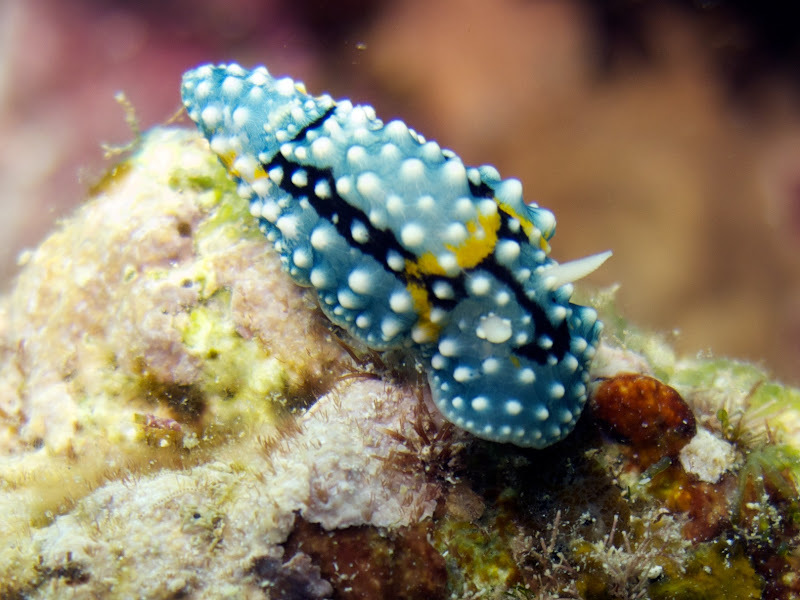 As we came out of the cave, Erica motioned to a very large Phyllidia varicosa nudibranch she had spotted along a rock outcropping. It must have been at least 2.5 inches long – my photo in no way does it any justice. 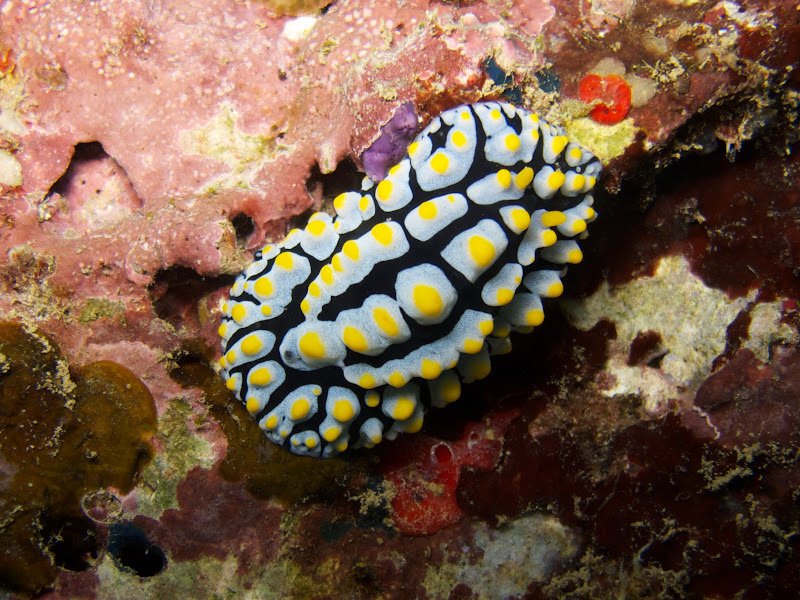 Great spotting this beautiful nudibranch Erica! 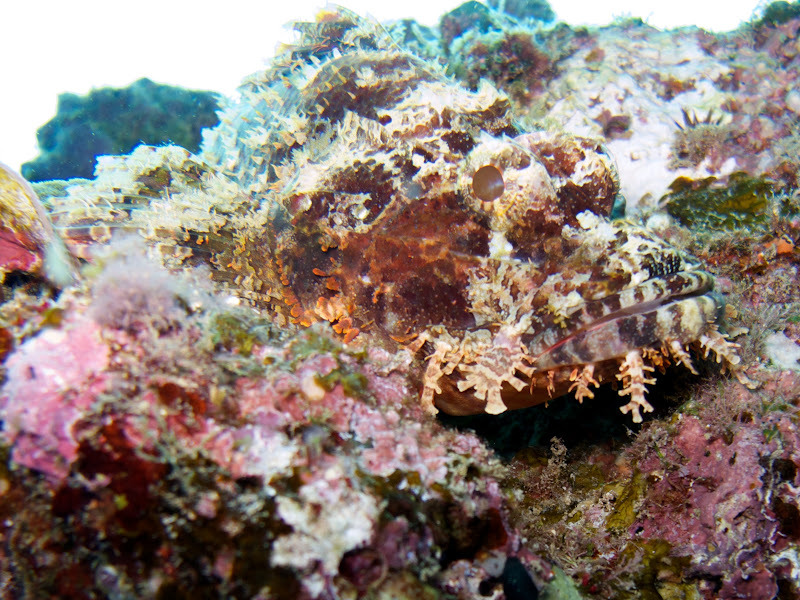 The last noteworthy fish we came across on the dive was a tasseled scorpionfish. I was inspecting the ledges when all of a sudden I noticed these two eyes watching me from above. “Hello to you too!” I waved Erica over to show her what I had seen. When she realized what I was pointing to see motioned back with an “OK.” We took a few photos and then kicked on to meet up with Jason and Tom at our safety stop location. After exiting the water and discussing what we’d seen, I had Erica and Tom search through my copy of the book Reef Fish Identification: Tropical Pacific to see if they could identify the fish they had drawn pictures of. I was really impressed with their artwork (way better than anything I could have come up with), and each was able to correctly identify several fish. This book is an awesome tool for anyone interested in finding out what fish they spotted underwater…I use it all the time! If interested in purchasing your own copy, check out the links below!